FindItMore | If you are looking to buy a used forklift, then you need to be careful. Not only are used forklifts a liability when it comes to the lives of your employees but they can also adversely affect productivity. After all, there is a reason that the forklift is for sale to begin with, and it is always wise to be wary of the underlying cause. Though most used forklifts may be fine and function properly, some may not be as reliable. Often, Used Moffett forklifts are the target for an employer since they offer greater safety, better efficiency and overall a compatible addition into the existing fleet of forklifts. There is a reason why these forklifts are among the most sought-after forklifts in the world, but we will come to that later. For now, let us focus on the dangers attached to operating used forklifts. The Occupational Safety and Health Administration (OSHA) estimates there are around 35,000 serious injuries resulting from forklift accidents every year. A considerable chunk of these is a result of a used forklift malfunctioning or causing a mechanical problem in some way. Let us look at some of the common dangers of operating a used forklift. Why Used Forklifts are more dangerous? Driving even a brand-new forklift has certain dangers attached to it but when it comes to used forklifts, those dangers are compounded and magnified. Just the fact that the forklift has been in use for a prolonged amount of time makes it risky. If you couple that with an untrustworthy re-seller then the chances of an accident occurring are increasingly likely. That is why the most important step to take while looking for a used forklift, is to be sure of the authenticity and reliability of the retailer you choose for the purchase. These retailers ensure that only the best and mechanically sound forklifts are sold to the consumers so that they may fulfill their material handling needs. After all, used forklifts have older components and have endured more wear and tear through their years of service, which makes them a risk to purchase for sustained material handling operations. The least you can do to ensure the safety of your employees is to buy it from a trusted retailer with an authentic and reliable track record. Wear and Tear: As mentioned above, used forklifts have endured more wear and tear throughout their life as compared to new forklifts. This makes them risky during operations as any vital component may have rust on it, be broken, or damaged, which could lead to the forklift dropping its load at a crucial time or tipping over. This leads us to our next point. Faulty Center of Gravity: The center of gravity is very important when it comes to the stability of a forklift. The center of gravity of a forklift must at all times, remain within the triangle of stability, which is the space between the front wheels and the center point between the back wheels. For a used forklift, this center of gravity may shift because of a technical glitch in the mast, tires, or the counterbalance. 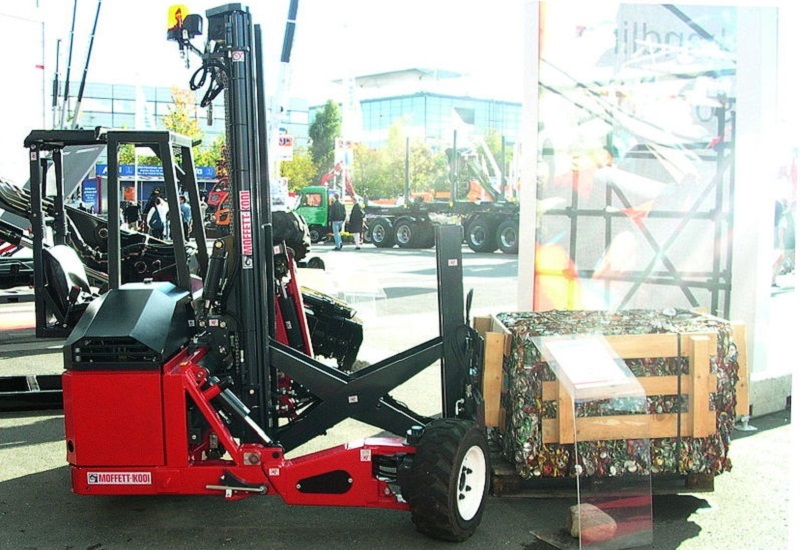 This is the reason Moffett truck mounted forklifts are so widely sought after; because they have hydraulic stabilizers that make them extra stable and secure during operations. Even for used Moffett forklifts, this stability is a trademark feature as hardly any Moffett malfunction during the lifetime of their operations. Technical Deficiency: Certain technical deficiencies might develop in a forklift throughout the course of its lifetime such as a reduced maximum carrying capacity. This is indeed a grave danger for any operator who is unaware of the forklift’s deficiency. If he or she tries to lift a load heavier than the diminished carrying capacity of the used forklift, it may cause the combined center of gravity of both the load and the forklift to move out from the triangle of stability and thus making it tip over. This can lead to serious injury as well as a fatality in some cases. These were just some of the dangers that tag along with a used forklift. Of course, there are ways to minimize them such as vetting the retailer properly as mentioned above. Other tips to make sure your used forklift is ready for operation to include driving the equipment before you buy it and test all the technical functions as well as the mechanical components before purchase. This can put your mind at ease regarding the safety of the forklift and you can use it in on-site operations.